The further north you journey from the Brecklands, the lovelier the villages get. 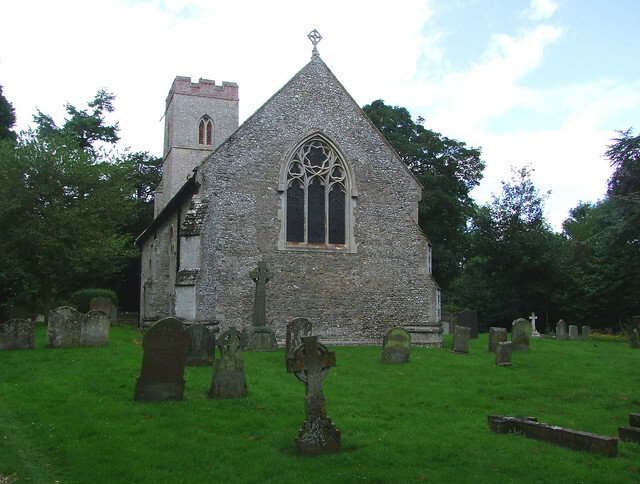 St Andrew is a pretty little church in the quiet lanes south of the Sandringham estate. The tower appears to be entirely from before the Black Death. Pevsner mentions a bequest of 1446 for 'emendation to the tower', which may well have been just a repair job, indistinguishable to us today. 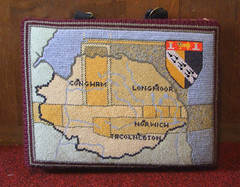 The area between Kings Lynn and Swaffham was knocked back hard by the pestilence of the mid-14th Century, and didn't really recover until the 19th Century. It is noticeable that grand late-medieval statements in this area are few and far between, though they do exist. 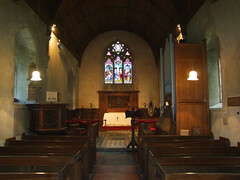 The nave and chancel are a hotch-potch of various centuries - more 'emendations', one assumes, but internally it is the substantial 19th Century restoration which gives St Andrew all of its character. 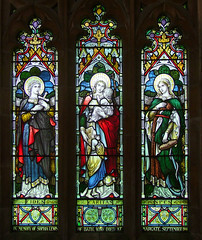 There was probably a fair bit for the Victorians to do, and they did it well, preserving the feel of a rural church but including some high notes of triumph. It is not all entirely modern. 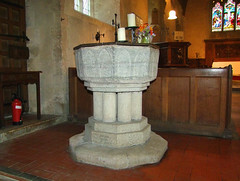 There is one of those panelled Purbeck marble fonts of the 13th Century, and there is also some surviving medieval and Jacobean woodwork built together to form a tower screen. 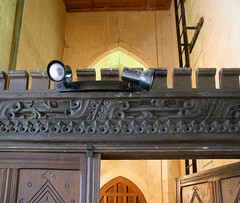 The Jacobean work was probably panelling, but it is hard to say exactly where the medieval work came from. 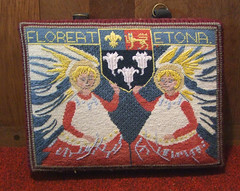 The lower part is almost certainly from the top of the rood screen, but the unusual design of the upper part suggests it might once have been an upright rather than horizontal. However, they appear parts of the same piece of wood. A puzzle. Nothing else is old. 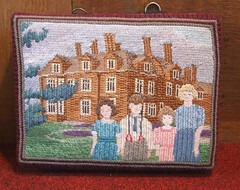 But there is a charm to the interior, a pleasing warmth. 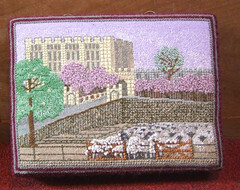 The star of the show is probably the set of kneelers - not a phrase I ever thought I'd write, but they are certainly the most splendid I've seen in a Norfolk church.They were designed by a local woman, Joan Ross, and made by members of the Embroiderers Guild and the West Norfolk needleworkers as a memorial to a local embroiderer, Susan Gurney. 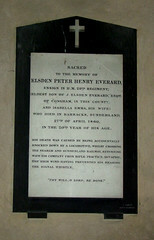 They depict scenes pertinent to her, as well as more general Norfolk church and country life. The parish are obviously very proud of them. 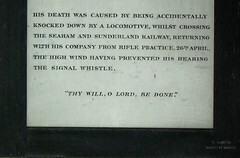 Up in the chancel, I liked very much the memorial on the south chancel wall which records that Elsden Peter Harvey Everard was accidentally knocked down by a locomotive whilst crossing the Seaham and Sunderland railway, returning with his company from rifle practice, the high wind having prevented his hearing the signal whistle. The pulpit is a handsome piece. It was produced by the Royal Carving Workshop on the Sandringham estate in the 1890s, and has the suitably serious quality of the decade. 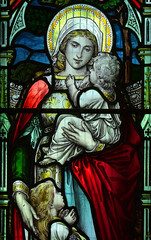 It is noticeable as you travel around this area how many of its churches underwent high quality improvements in the ten years either side of the new century, as the Prince of Wales, and then King, went about restoring the local villages of what had been one of the poorest areas of England. 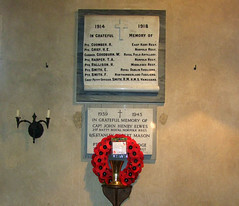 Perhaps the workshop was also responsible for the reredos. 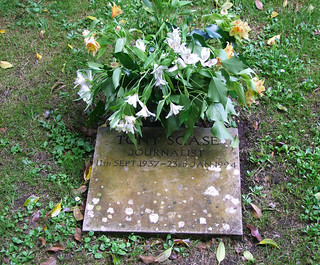 Outside in the churchyard I spotted a name from my childhood, the journalist Tony Scase, who died in 1994. 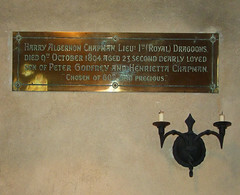 He was a regular presenter on East Anglian television for both BBC East and Anglia TV, and in his lifetime he was a supporter of Congham church.